$15 Off Promo Code for SHRM Chapter Members who need to recertify. Enter Promo Code: 15OFFCSC expires December 31, 2018. 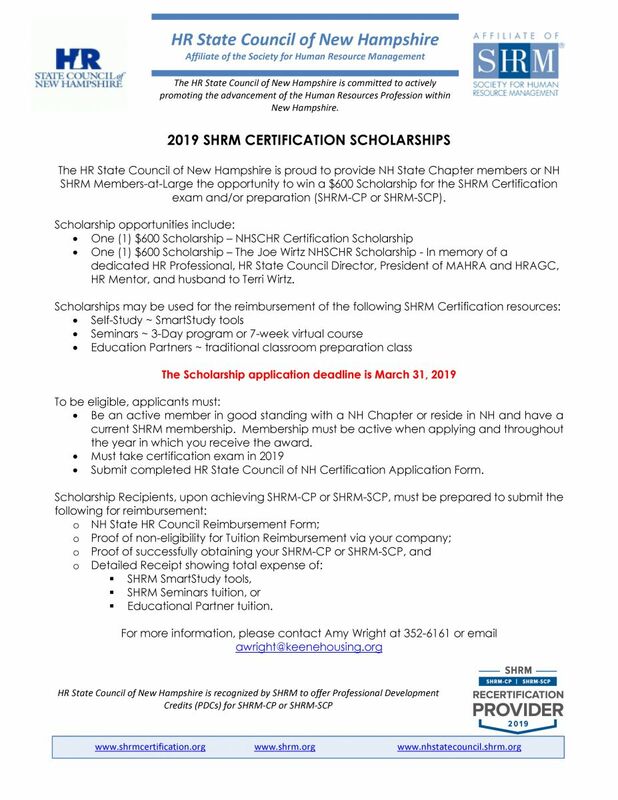 The HR State Council of New Hampshire is proud to announce the winners of the two $600 scholarships for the SHRM Certification exam and/or preparation (SHRM-CP or SHRM-SCP). Please join us in congratulating Mandy White and Debra Norris, the 2018 SHRM Certification Scholarship winners! Both Mandy and Debra are members of Greater Monadnock SHRM and are committed to advancing their education, organization and profession. The SHRM certification gives them the opportunity to demonstrate the core competencies needed to ensure success in today’s business environment. Congrats to both Mandy and Debra! Help your NH chapter and the HR State Council of NH by recertifying in 2018!!! Have you already earned your 60 PDCs needed for SHRM recertification or are you almost there? Did you know you can recertify early and it will not affect your renewal date? SHRM is offering a bonus during 2018 of $20 per chapter member designating your chapter as primary and $10 for every recertified member in the state. Remember, if you have more than 60 PDCs, the extra are not going to contribute to your next recertification --- but they certainly will contribute to your professional growth and development! If you have any questions, please contact Amy Wright, Certification Director at 283-5457 or email awright@keenehousing.org.